This area boasts some of the most dramatic scenery and you are never too far away from its captivating coastline, where the adventurous will find ample opportunity for water sports. To the west, you can explore the unspoilt bays of the Costa Verde, on the far-reaching sand dunes at Piscinas, which have been sculpted by strong winds over the years. The Costa Verde offers stunning contrasts from the magnificent but sparsely visited beaches to the densely forested hills and mountains of the Iglesiente. The eastern coast provides some fantastic beaches and except for a few stretches, most of these can only be reached by boat, after walking a long way or by driving on dirt tracks. Amongst others, Cala Gonone and Cala Luna are both exquisite and secluded, backed by majestic limestone and macchia covered mountains. Whichever direction you take, east or west, you will be sure to find some beautiful coves and inlets. 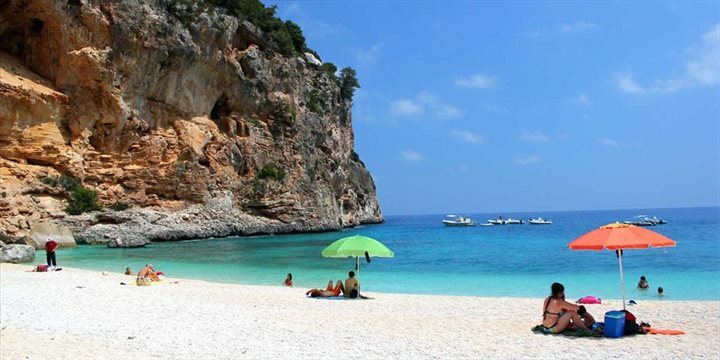 The area around the spectacular Golfo di Orosei, with its limestone cliffs and secluded coves, is a must see and you can pick up various boat trips from Cala Ganone. There is some excellent diving in this area as well and there are several schools that will hire out the requisite equipment. A little further up the coast at Santa Maria Navarrese there are other diving opportunities that are well worth exploring. You’ll find abundant opportunities to trek in the mountains across central Sardinia and much of the time it pays to simply study a map and plan your own route (though of course be sensible). If you’re looking for something particularly impressive you could do a lot worse than the so-called Grand Canyon of Europe at Gola Su Gorruppu. This mighty gorge, purportedly Europe’s deepest, can be reached from the town of Dorgali. The Costa Verde coast is at times a wild place and can provide some great conditions for windsurfing and surfing but as high seas can develop rapidly some caution is necessary. The beaches of Scivu and Piscinas are both renowned for their surf and both are easily accessed from the town of Arbus.